Preheat the oven to 180°C. Prepare 4 small coffee cups by greasing with the softened butter using kitchen paper in a vertical motion from the base of the cup to the lip. Add 1 tbsp of cocoa powder to the cup to dust the inside of the cup. Tip out any excess cocoa powder and place the cups on a tray ready for the oven. In a mixer, whisk the egg whites until soft peaks begin to form and gradually add the caster sugar until stiff. 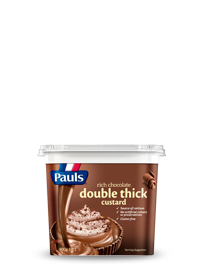 Gently fold in the chocolate custard and spoon the mixture into each cup to the top. Flatten the mixture by sliding the back of a knife across the rim of the cup then run the tip of your thumb around the rim to slightly release the body of the souffle from the cup. Bake for 8-10 mins and dust with icing sugar.